OMGawd, I’m Going To Europe! The timing of all of this is actually quite perfect. My friend, who did the planning and inviting (yay! ), is currently stationed in Virginia for work. And where did my latest vegan adventures place me just in time for a joint adventure? Virginia of course! So, on Sunday afternoon we hopped a quick flight from VA to DC and then from DC to Paris. Our flight to DC was delayed by at least an hour or so due to weather so we ended up missing our connecting flight to Paris. However, all was NOT lost! After about three hours in line at customer service (no biggy!) we were booked on the next flight to Paris which left only a few hours after our originally scheduled flight, and happened to be a shorter flight as well. Perfect! This did leave us some time to scout out vegan noms at the Dulles Washington airport as we weren’t flying out until nine-something. After walking up and down Terminal C a few times, asking around a little, and doing some label reading to no avail, we eventually found ourselves staring at the menu board at a place called California Tortilla. To our surprise the word ‘vegan’ appeared on their menu. Just once! But that’s enough for me!! Especially when I’m a hungry hungry hippo! 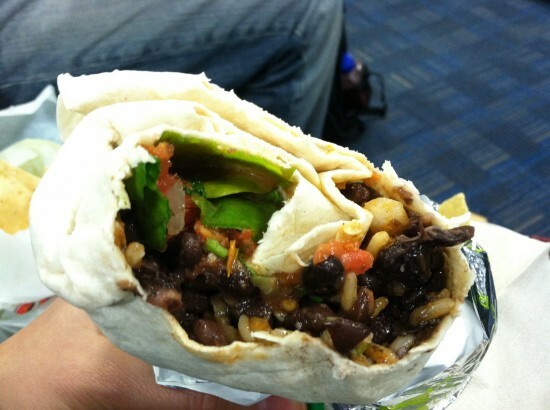 The “No Meato Burrito” – sauteed veggies, rice, black beans, guac, spicy sunset sauce, leaf spinach, and salsa “(vegan friendly)” hit the spot. Perfecto! 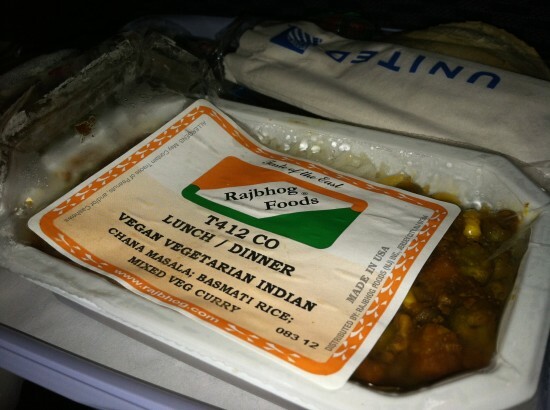 During the 6.5 hour flight to Paris we were delighted to receive vegan chana masala as the main meal on board!! This is actually kind of a big deal. I’ve only been on one super long flight once before and I think the airline gave me a tuna sandwhich as their veggie option. Um. No. So this was a nice surprise. Although the side salad with cheese and ranch dressing, and bread and butter, were left untouched, this fairly tasty main course was gobbled up in no time. We arrived at the airport in Paris, picked up our luggage (thankfully it traveled with us despite the delay and missed flight), taxied to our hotel, checked in, took a two hour nap (if you’re like me and have an extremely difficult time sleeping on airplanes — even during red-eye flights — then this part is key), and then set off to find vegan food! Yaaay!! Our very first dining out experience took us to one of the oldest veg establishments in Paris, Le Grande Appetit. Very cute and very welcoming. The server and chef/(owner?) were very kind and thankfully spoke English pretty well. Better than either of us can speak French! Since we had arrived before 7PM we were initially told that they were only serving limited items. However, the chef came out to say that we could order anything we wanted off of the regular menu. How lovely! 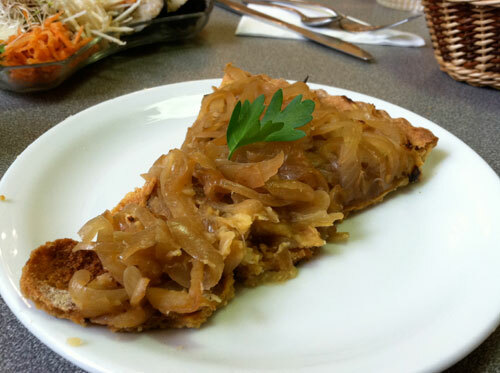 We decided on a piece of the chickpea and caramelized onion pie, as well as the nori rolls. Pretty good! As we were finishing up, another English speaking couple came in and sat a few tables down from us. They asked us if we were from the States and then ended up chatting with them for a little bit. One of the two are vegan, though her partner jokingly admitted that he’s on the cusp or has been toying with vegetarianism for a while. We learned that they’ve spent quite a bit of time in Paris. It’s one of their favorite cities though they currently reside in North Carolina. They were incredibly kind and made a few vegan restaurant recommendations as well as explained to us how the city is broken up into twenty arrondissements municipaux administrative districts, or arrondissements (see map here). Once we understood how this worked it made it much easier to get around. Now that we were rested and full it was time to do some exploring! Pictured below: a beautiful side street (I need to take some pictures of the super cool doorways and courtyards around here! 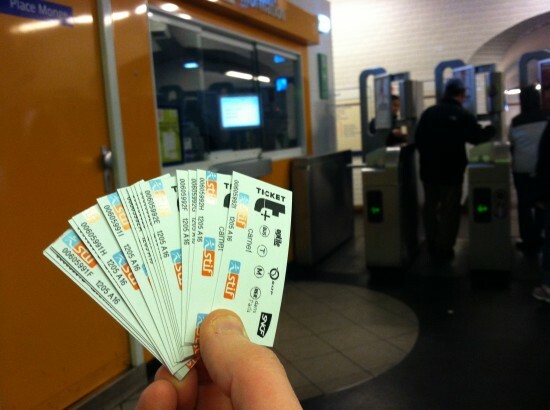 ), metro tickets (one per ride! 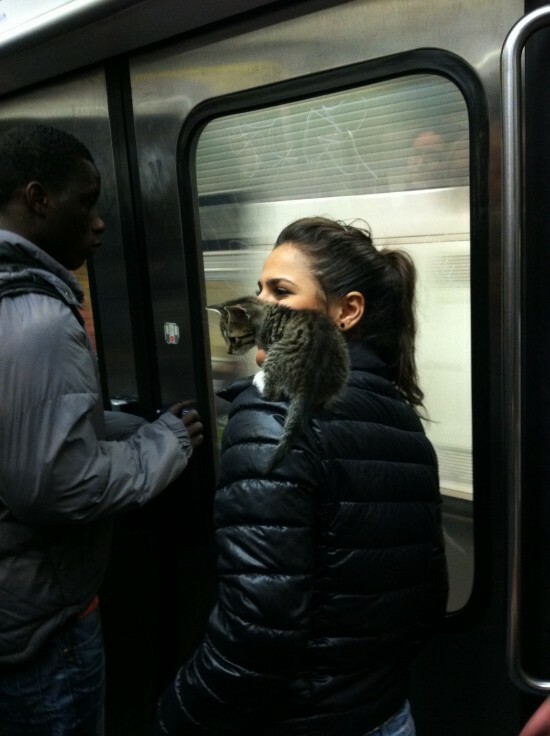 ), a kitty on the metro (what!? 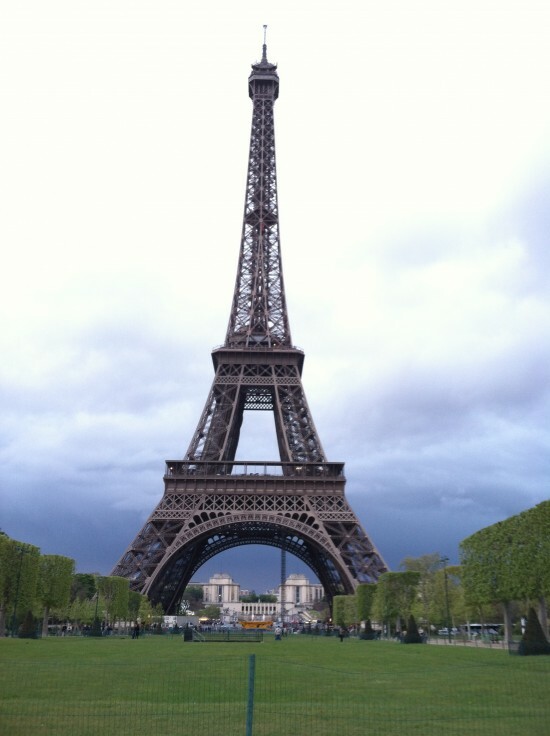 ), and the Eiffel Tower (oooh aaaah). Believe it or not it was close to 9PM when I took the picture above, of the Eiffel Tower. Pretty light out! But given the time we needed to find a place to eat before heading back to the hotel. We ended up going to Loving Hut as it was open late and my friend Aurelia (who lives here!) said that it’s worth checking out. Perfect! This is by far the best Loving Hut location I’ve been to (there are hundreds of locations worldwide). 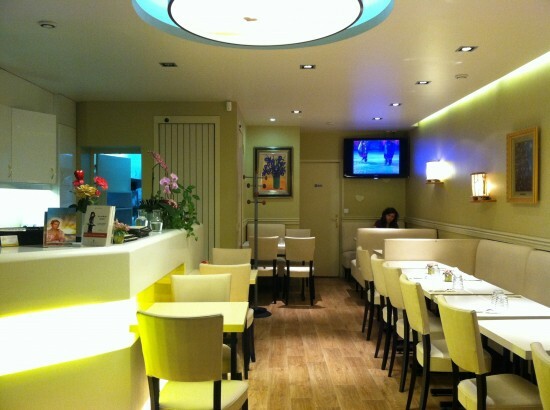 From the decor to the food, this place is really great! 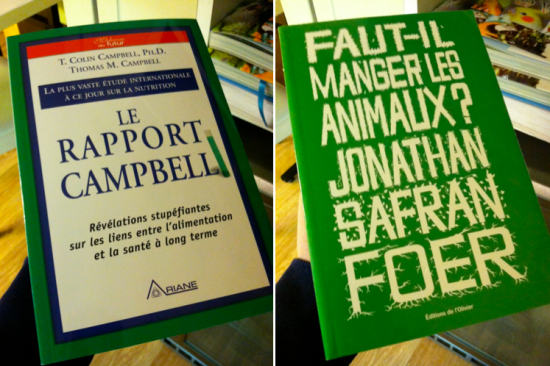 They also sell some to-go items, pictured in the case below, and carry some educational materials – like Colin Campbell’s The China Study and Jonathan Safran Foer’s Eating Animals, in French (of course!). For food we ordered the fresh spring rolls, pho soup, and pizza! For dessert we had a banana split. Eating vegan in Paris?! No problem, ami!!! 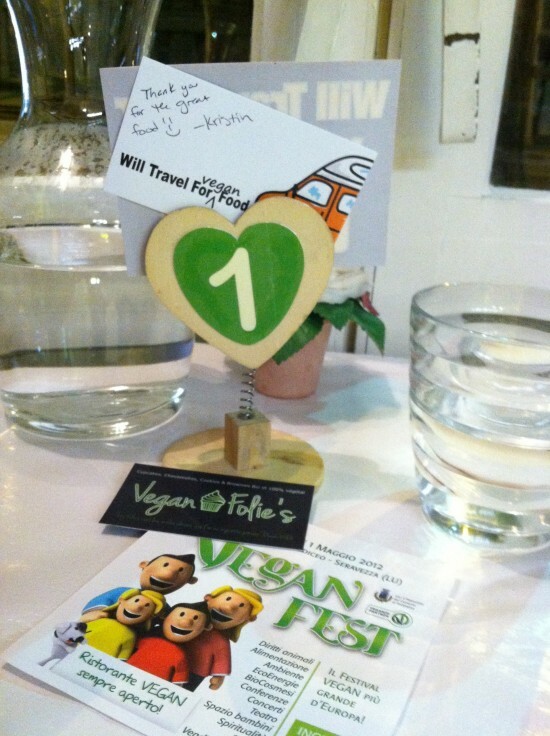 On our way out I left behind a ‘Will Travel For Vegan Food was here’ decal and business card. I might have also staged a business card, for a vegan sweets place here called Vegan Folie’s, as well as a flyer for VeganFest in Italy, in this pic. Teehee! It’s around 11:30AM on Tuesday right now. We’re going to meet up with a friend for lunch, do some more sight seeing, probably more food (w00p! 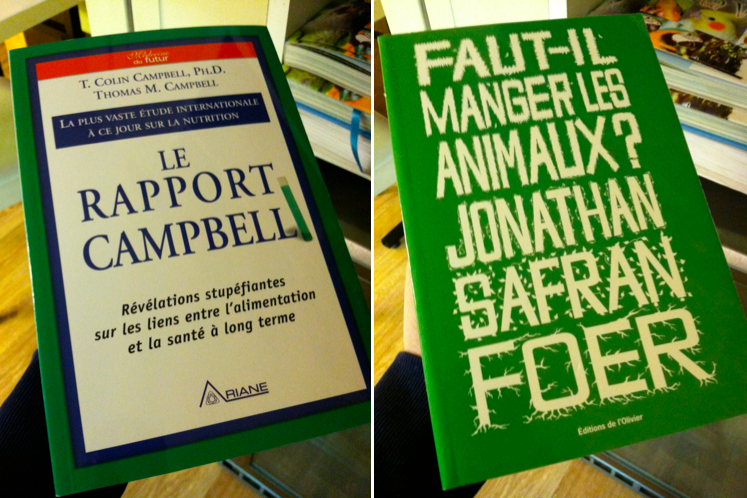 ), and then back to the hotel so I can update you on even more vegan goodies from Paris! Weeeee!!!! I am speechless daughter and a bit teary eyed ~~ :-)Enjoy, learn, have fun and veganize, THIS IS GREAT, Luv ya much!! 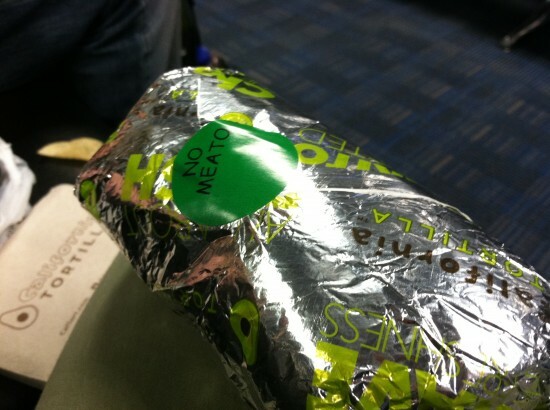 I wish I had found that No Meato burrito when I was at Dulles airport. I think I actually ended up with some tomato sauce spaghetti… not bad, but definitely not perfect. 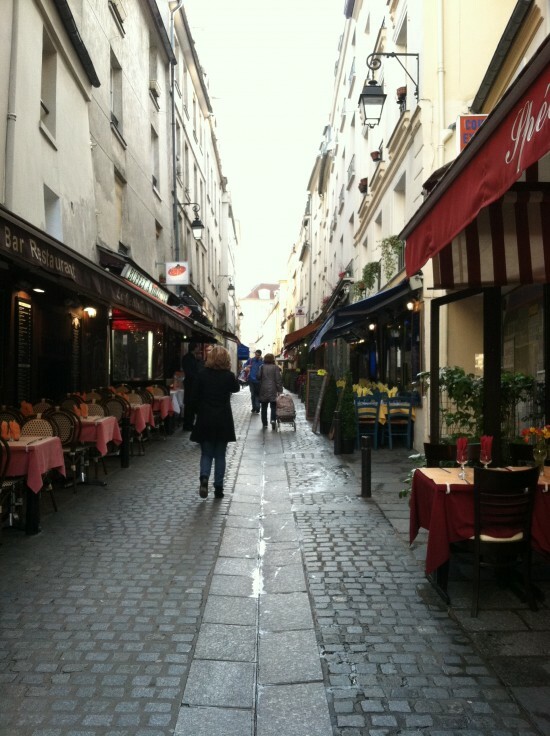 I went to Paris this winter so I had fun reading about your experience. I was at the Gran appétit and ordered the sushi though. They were pretty good, as you said, but I wish there had been wasabi and ginger to go with them. The side salad was very good though. I wish I had ordered that onion tart. It just looks so good. 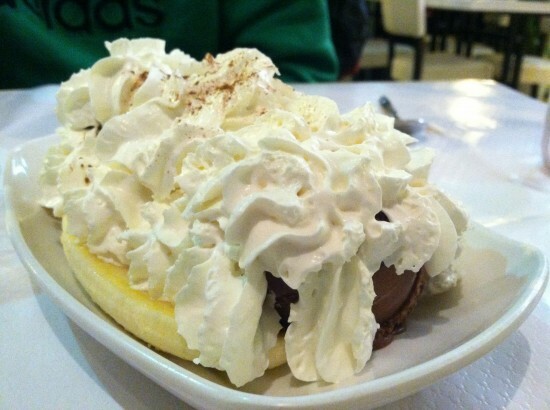 Isn’t the banana split so great at the Loving Hut? I couldn’t get enough of it. I had that and the pizza and really enjoyed it all, although it is a bit pricey. And the no-muh cheese is great too. It’s great to hear of your travels, and that you are having fun. Europe?! Awesome! Can’t wait to hear and see what’s to come. All the best. Hi Kris — I can’t believe you’re in Paris! I think it’s truly wonderful and exciting what you’re accomplishing. Your blogs are fun and interesting, and it’s great that you’re meeting so many people along the way. Be safe, and enjoy all the adventures coming your way. Hi Aunt Colleen!! Thanks so much! I’m most certainly having the time of my life! :) Love you!! wow! how awesome, i hope you have a wonderful time! 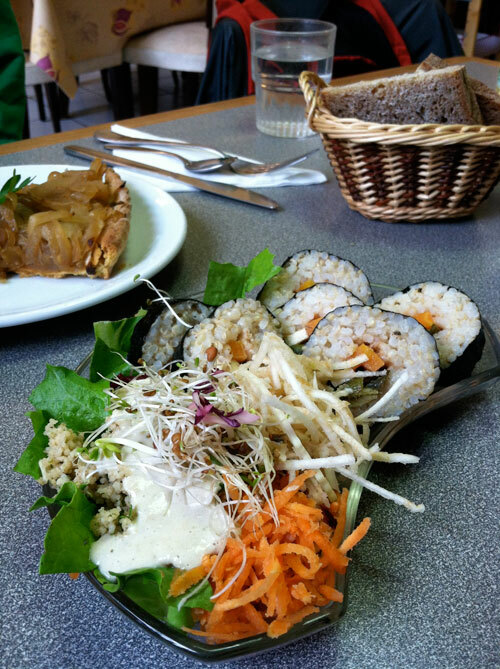 i went to paris 12 years ago, for 10 days, and we managed to find a different vegan restaurant each night… amazing! 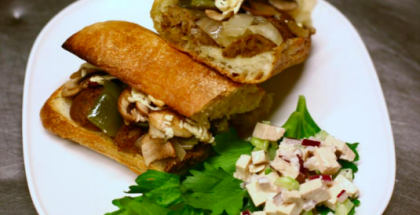 great vegan food and dogs everywhere (as well as dog poo- watch where you step!). we are getting ready to open, and can’t wait to see you again, this time, we will have to have some dinner together and talk about your trip! hurray! Clod! We’re heading to Milan today! I emailed you!! :) Hope to meet up! Thanks, Dad! :) Love you!! Thanks very much for your report! We’re going to be there soon, so thanks for being the forward team. 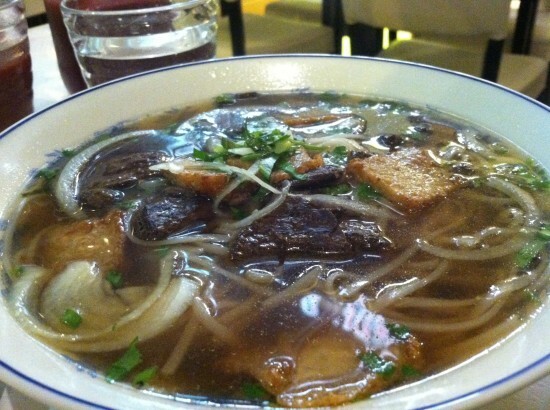 That pho looks amazing. I wish we had kittens on the Metro in DC. But I’d probably never want to leave if we did. I am going to Paris next week. Someone led me to your site. 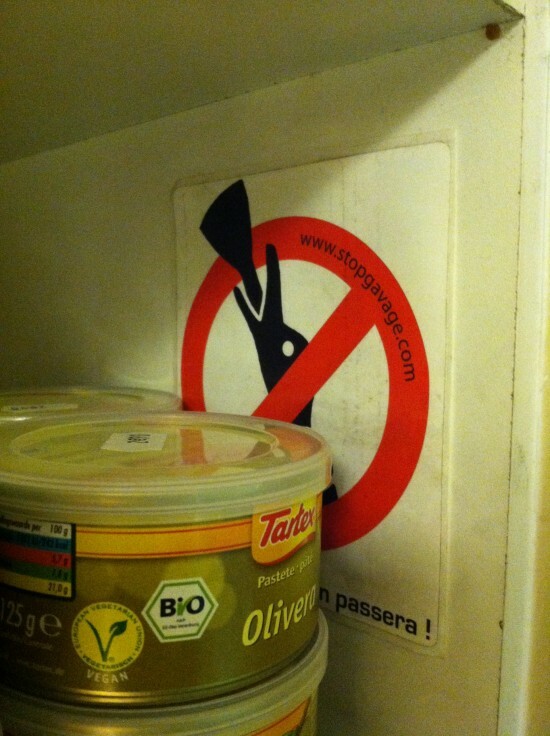 It’s awesome to know that there are plenty of vegan options in Paris. I am staying in a hotel at the 3e arrondissement and I hope to find vegan places nearby. Thanks for sharing your experience! I got back from Paris over a week ago and had an awesome time! 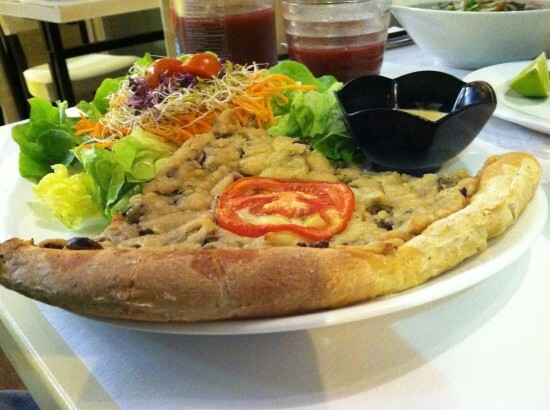 I was able to try some of the veggie restos that you mentioned in your blog. My partner Daniel and I stayed in the Marais district where we tried Le Potager du Marais on Rue Rambuteau (mainly vegan, but some of the dishes have goat cheese and dairy). We went there twice. I had the quinoa burger and the apple crumb and both dishes were delicious! The only problem is that the place is rather small and feels claustrophobic when it’s full. Also, the decor is hideous. We went to Rue Mouffetard to check out Vegan Folie’s and I met the young woman who was working there (I think it’s the same woman with whom you had a picture taken outside the store). But when we got there, it was almost 7:30 PM and we hadn’t had dinner yet, and since the place only sells desserts, we ended up going to an Indian place for our veggie dinner. So we missed the desserts at Vegan’s Folie! 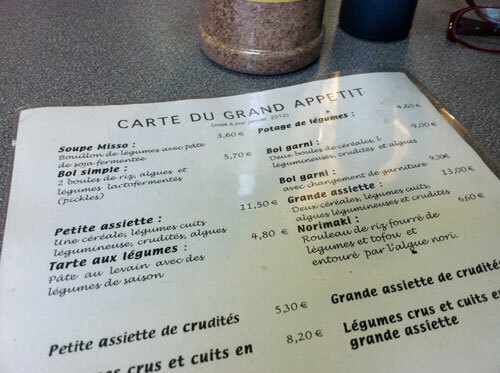 :( Oh well, next time… Nearly the same situation happened also when we went to Montmartre to try Au Grain de Folie for their dessertss, but they were all gone (we got there late afternoon). 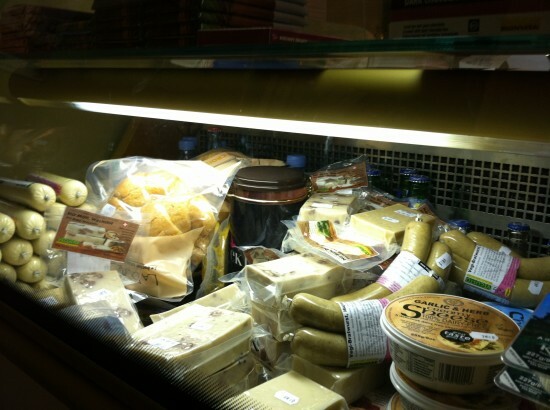 Then before visiting the Louvre, we went to Saveurs Veget’Halles on Rue des Bourdonnais. I wasn’t impressed with the location (right next to a noisy high school), but I have to say I was impressed with the menu, the service, the atmosphere and the prices. I loved the seitan steak and mango pudding topped with fresh fruit! 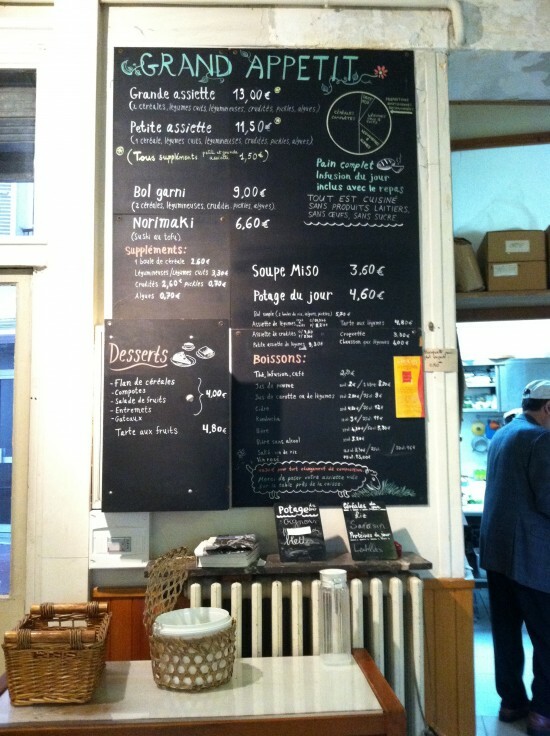 During my next time in Paris, this will definitely be the first vegan resto I will visit again! I told my server that the first time I was in Paris (23 years ago! 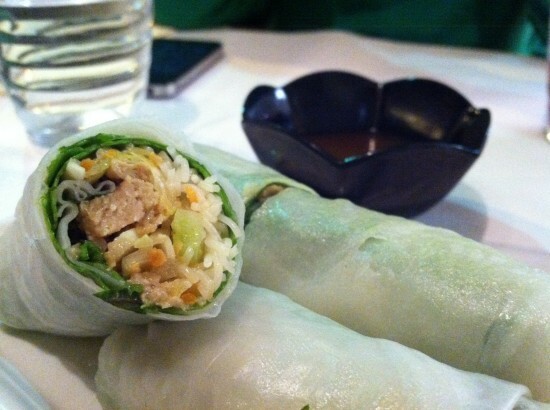 ), there were hardly any veggie places; but now there are about a dozen or more! So times are changing! After our visit to the Pere Lachaise cemetery on a Sunday, we walked over a mile to The Loving Hut but much to our dismay, it was closed! Darn! 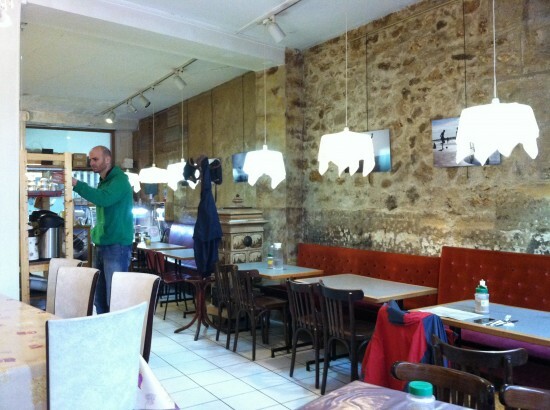 Finally, we tried Voy Alimento at Rue des Vinaigriers. I tried the assiette crudite and I can tell you it was out of this world! 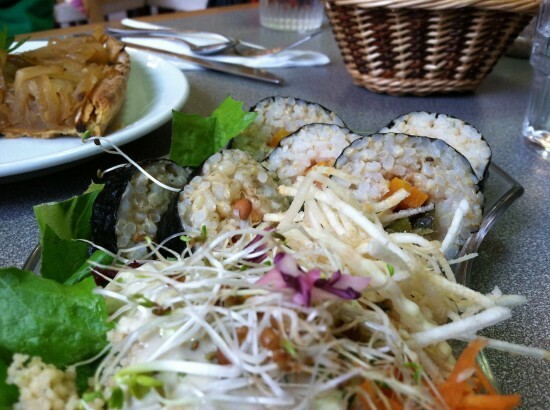 It was my first 100% macrobiotic meal! It was tasty, nutritious and delicious! I ordered it with acai milkshake (which was served in room temperature – also a first for me because I usually drink my shakes chilled). My server – I think she’s Brazilian – explained the restaurant’s philosophy of providing fresh, healthy and interesting ingredients. She sounded very well informed and charming. They have two friendly cats (one was purring constantly! haha). I would definitely come back to this place. In those times when we had problems accessing vegan places, we ended up eating in veggie-friendly Asian, Indian or Lebanese restaurants. I just wanted to share with you about my vegan experience in Paris and I can’t wait for my next visit to try out the vegan restos that I missed and try the new ones!